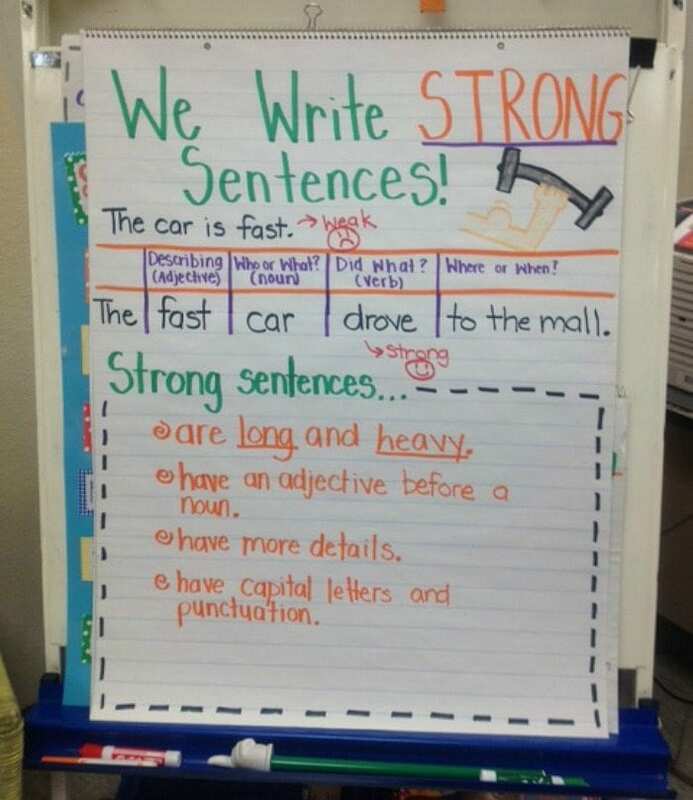 The video shows how this stoplight anchor chart can be used to help early elementary students understand and write clear paragraphs. As students are editing their work, have them read with green, yellow, and red pencils in hand so they can see how their paragraphs are hooking and engaging readers. 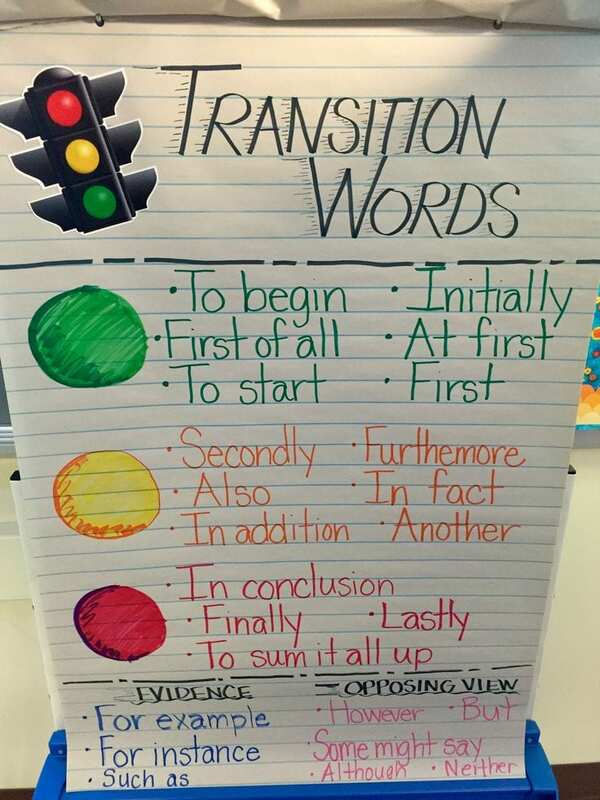 Here’s another stoplight anchor chart, and it’s perfect for helping students learn and practice their transition words. Draw the stoplight first and then invite students to help come up with different words. Then encourage students to put the transition words into practice. 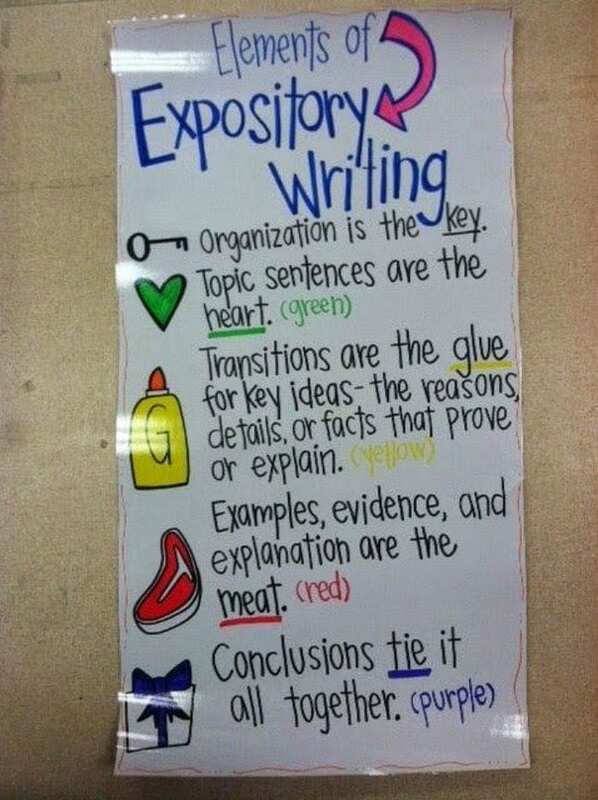 This is a quick and easy anchor chart to help students see different types of writing. It’ll also help them do a quick check to make sure their writing aligns. Keep going! 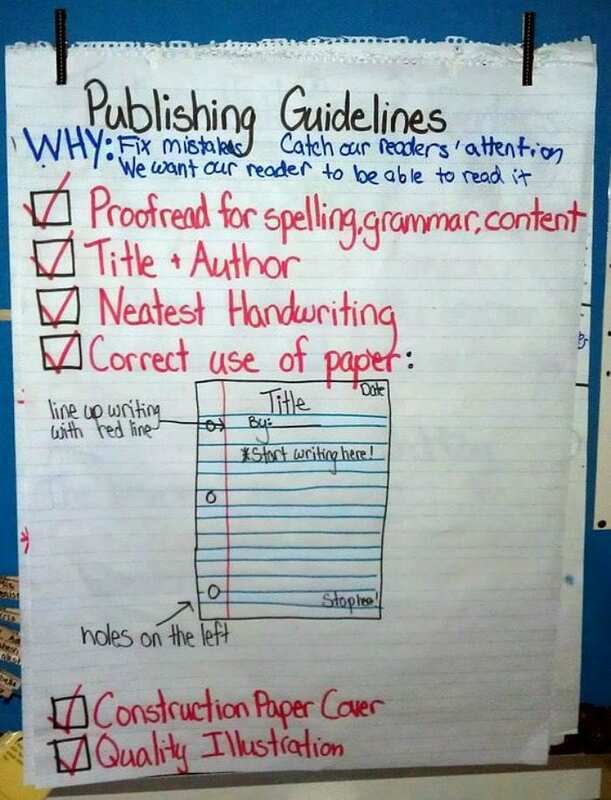 Sometimes it’s hard to express what you mean by certain writing and revision requests, so this is an anchor chart that shows exactly what you mean. 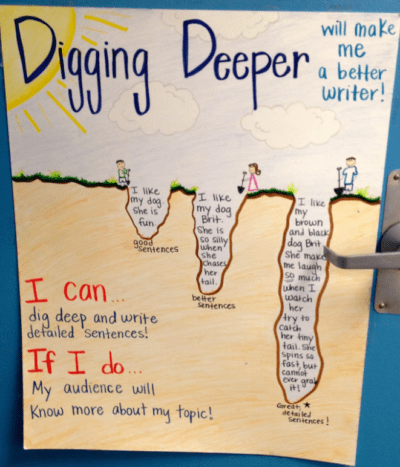 Now students can get a good look at what it means to dig deeper. 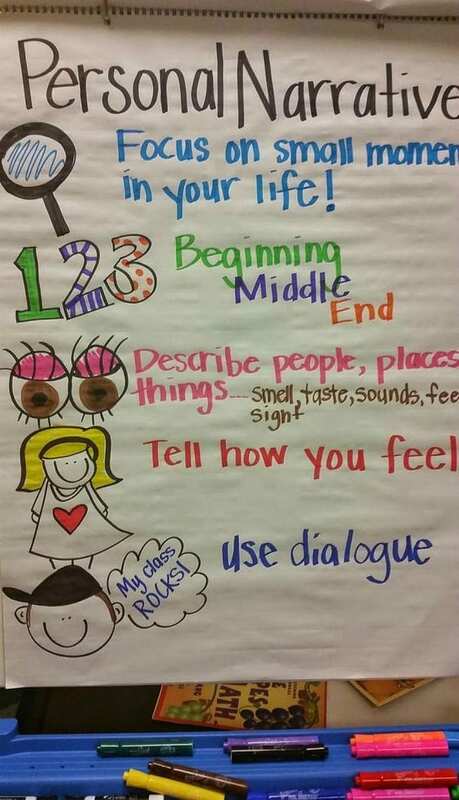 If your students are learning about writing dialogue, an anchor chart like this could really come in handy. Encourage students to try other ways to have their characters respond. Before you can write about character, you first have to understand it. 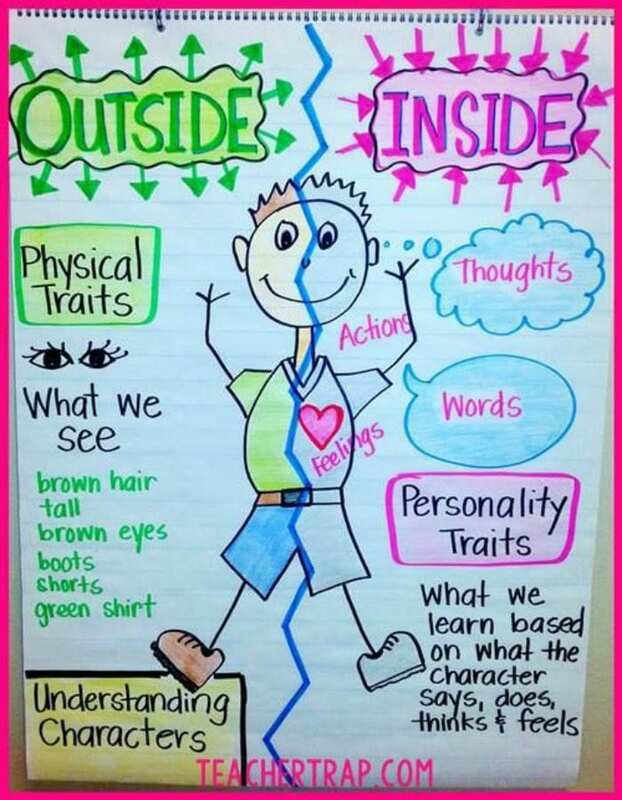 This anchor chart will help your young writers understand the difference between inside and outside characteristics. Now that your students understand the difference between inside and outside characteristics, dive deeper into describing a specific character. 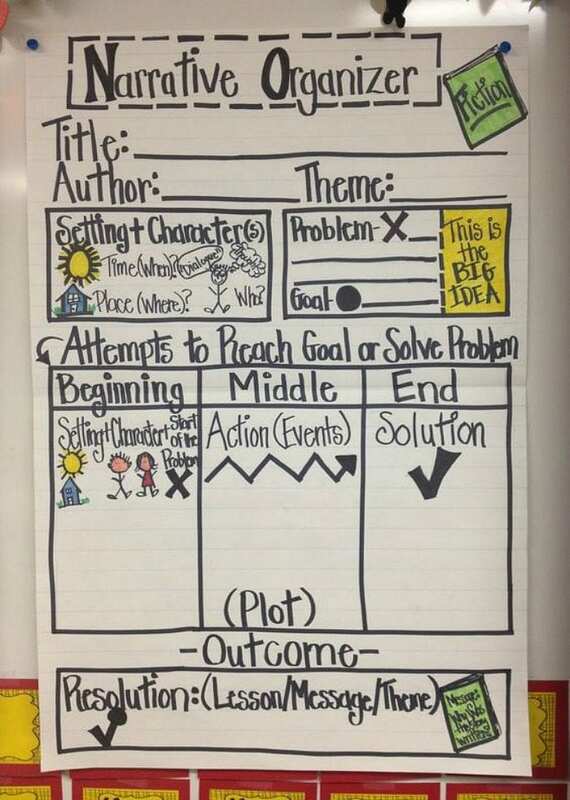 This anchor chart is a wonderful idea because students can write their idea(s) on a sticky note and then add it. 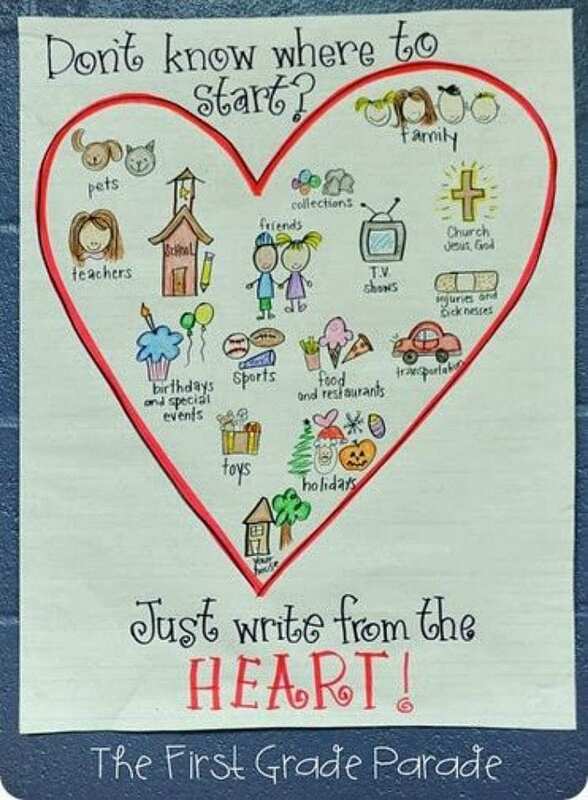 This anchor chart is jam packed with things to help fourth and fifth grade writers remember the six traits of writing. Use the chart as a whole-class reference or laminate it to use in small groups. When it’s laminated, students can check off each aspect they’ve included in their own writing. Meaningful dialogue? Check! Problem and solution? Check! 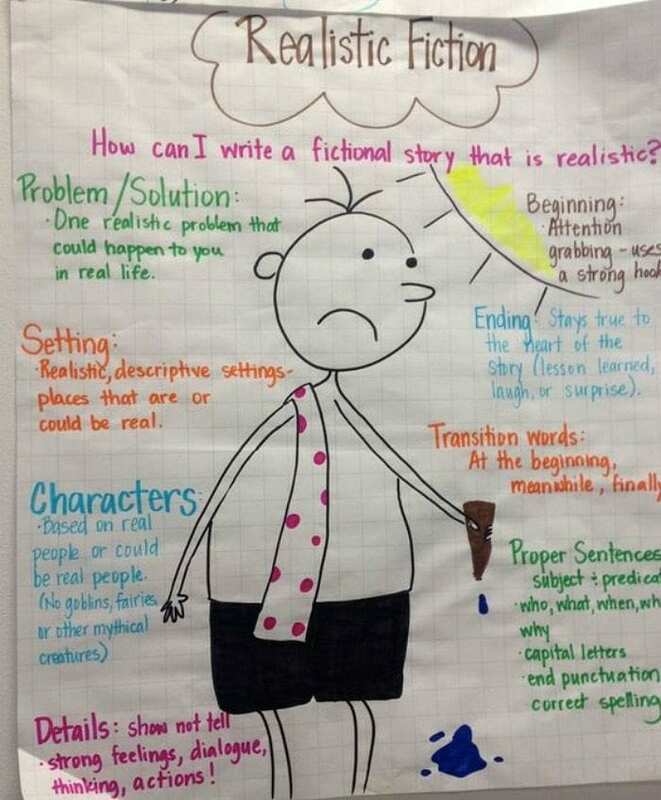 This anchor chart reminds upper elementary students how to create realistic stories. It really walks your students through the process, so they have all the elements they need to create their own story. 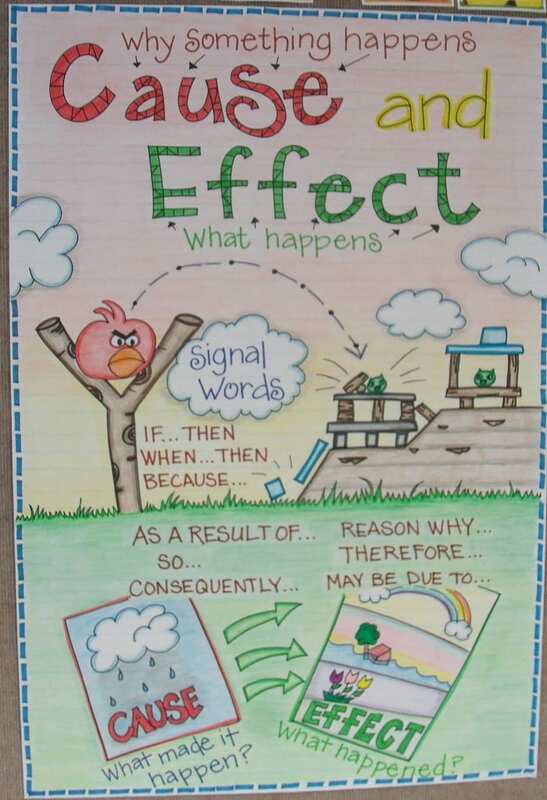 Help early elementary students stay organized with an anchor chart that’s focused on order-of-events language. Tactile learners can write their first drafts on sentence strips and use this format to put the events in order before they transcribe their work onto writing paper. Here’s another how-to video! 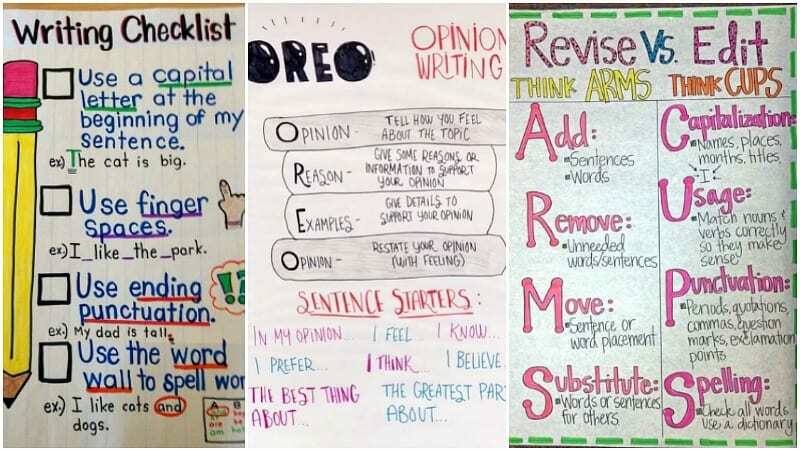 This deliciously inspired opinion anchor chart can be used by students in grades 3–5 during writers workshop or when developing an opinion for discussion or debate. To build out student writing, have them “double-stuff” their Oreos with extra E examples. Sometimes the hardest part about writing is coming up with whom and what you should write about. This is the fun part, though! 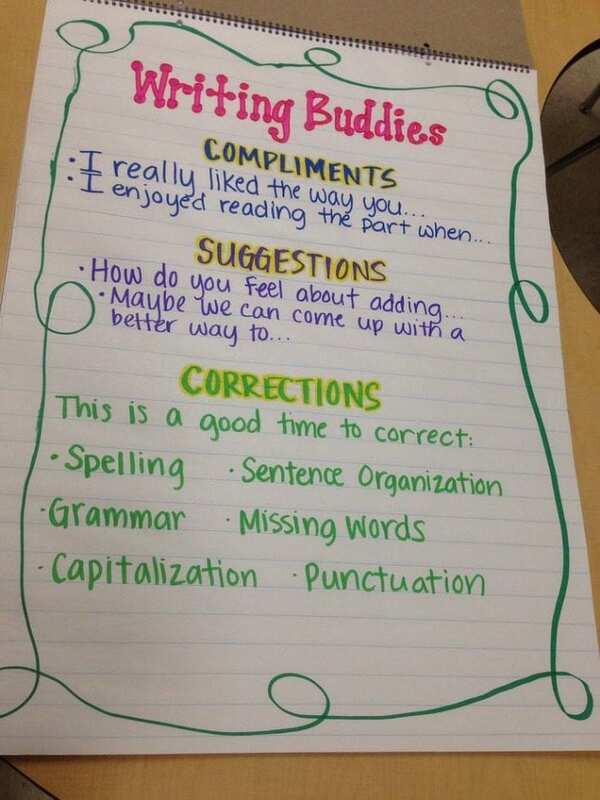 Use this anchor chart to remind your students that they have lots of good writing options. Use this anchor chart with middle schoolers to make sure they’re considering all sides of an argument, not just the one that matters the most to them. 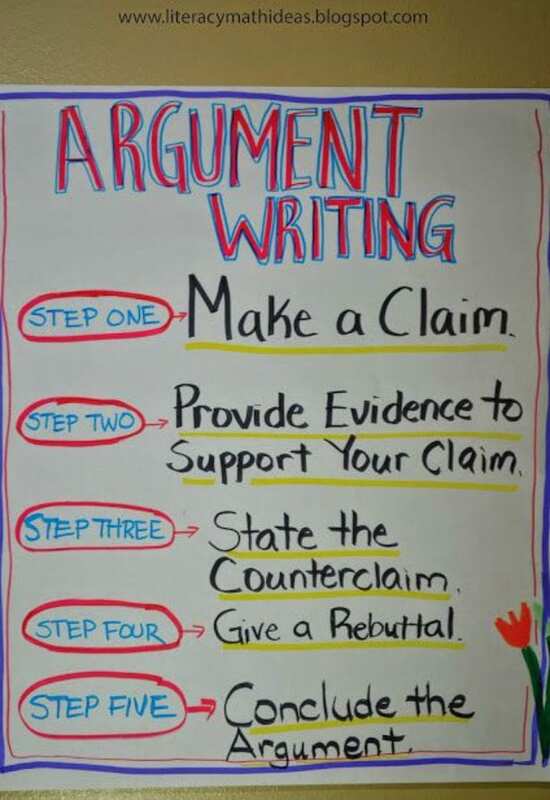 One way to adapt this chart, as students develop their understanding of argument, is to write each element—claim, argument, evidence—under a flap that students can lift if they need a reminder. 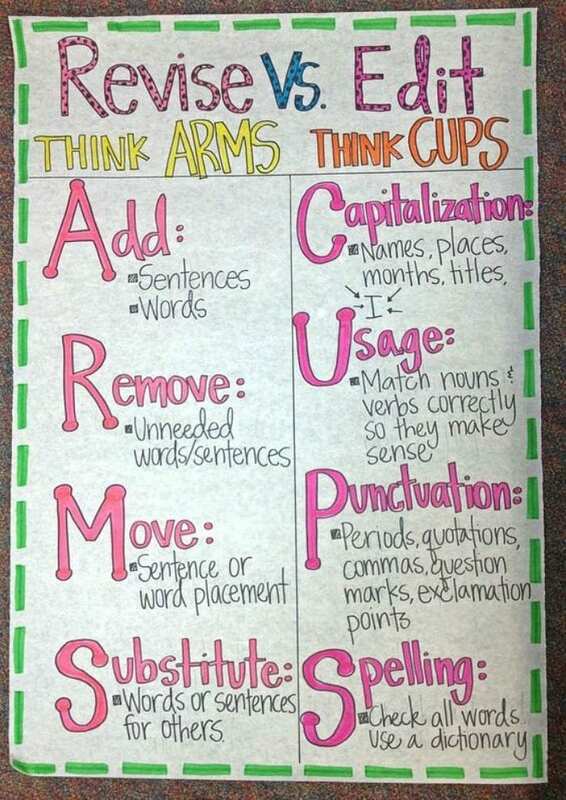 This is an anchor chart you’ll likely direct your students to again and again. 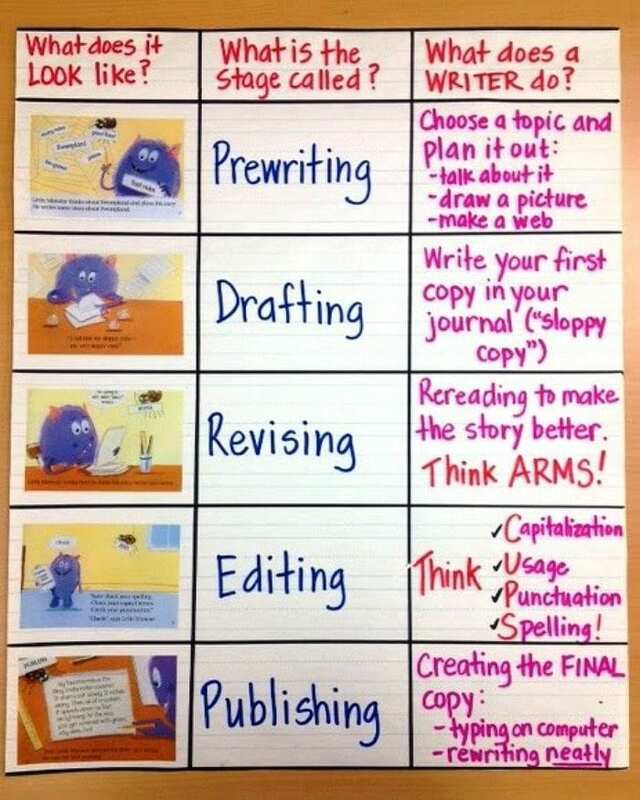 The writing process has several steps, and it’s good to remind students of this so they don’t get frustrated. 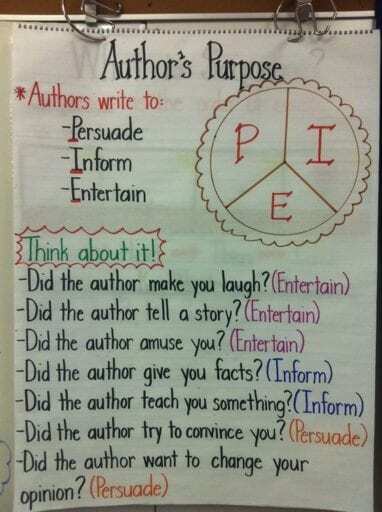 For those young writers in your class, these cover the basics in a clear way. Mrs. Puffer on Instagram writes that she uses this with her fifth grade students. 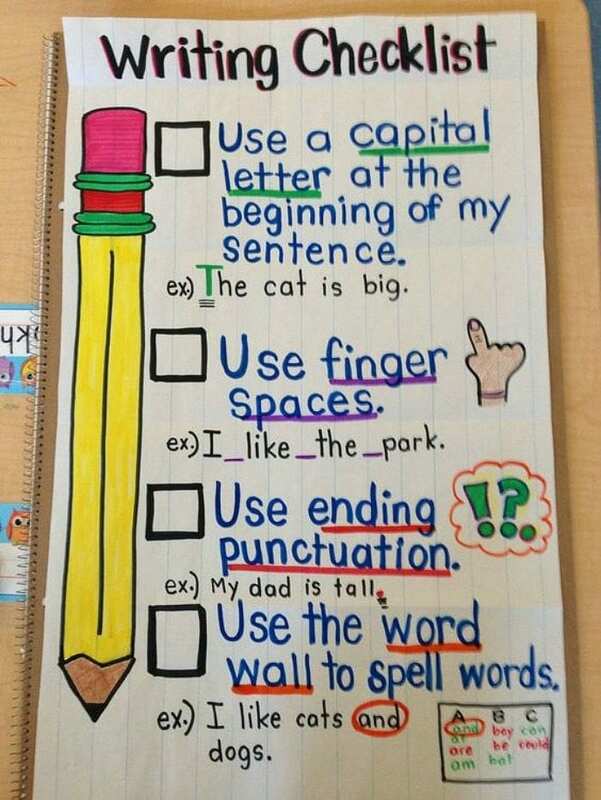 She says it’s a good strategy to help give her students a mini checklist when they’re writing. 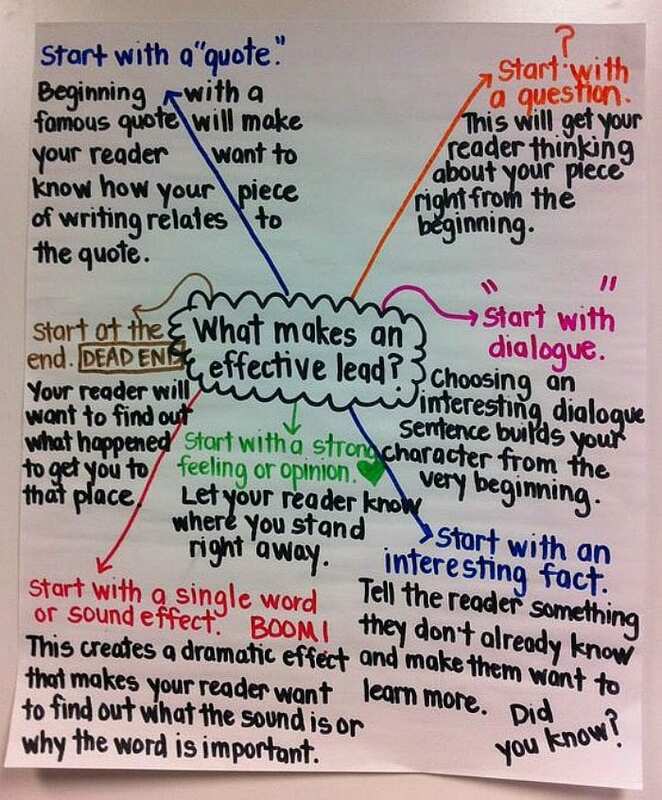 This sixth grade anchor chart gives students lots of ways to start their writing. It could be updated midyear with strong examples of leads that students have written or that they’ve found in books. 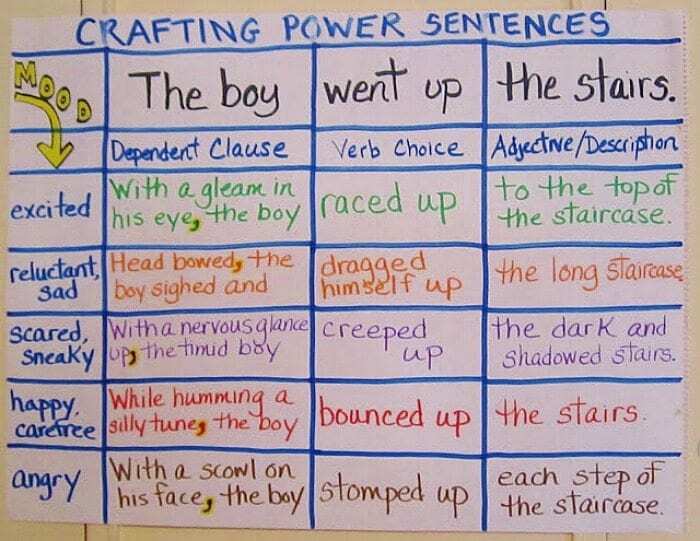 Students could also copy this chart into their notebooks and keep track of the different ways they’ve started their own writing, seeing if they’ve developed a signature lead. “Show, don’t tell” is a cardinal rule of writing. 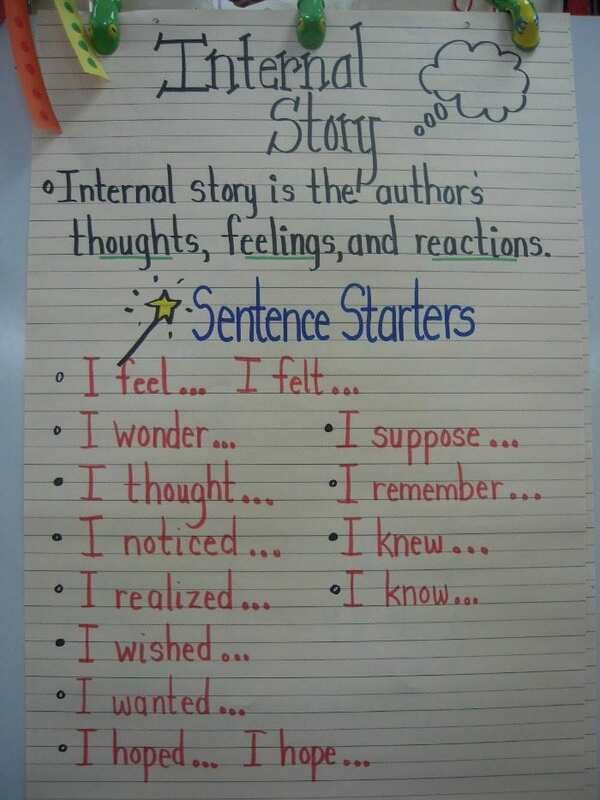 This anchor chart, best for upper elementary writers, can be used to strengthen scenes in fiction and narrative nonfiction works. 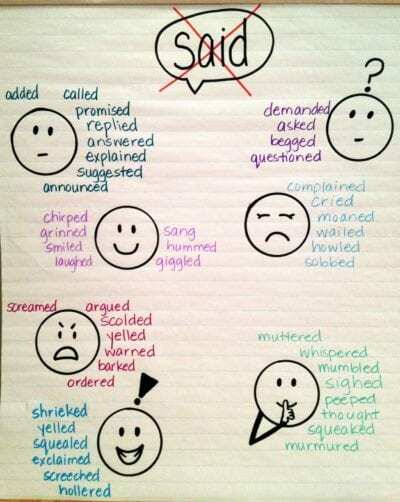 Build this chart out for middle school writers with additional ideas and more complex emotions. If you’re teaching writing, then chances are you’re teaching some form of editing, too. 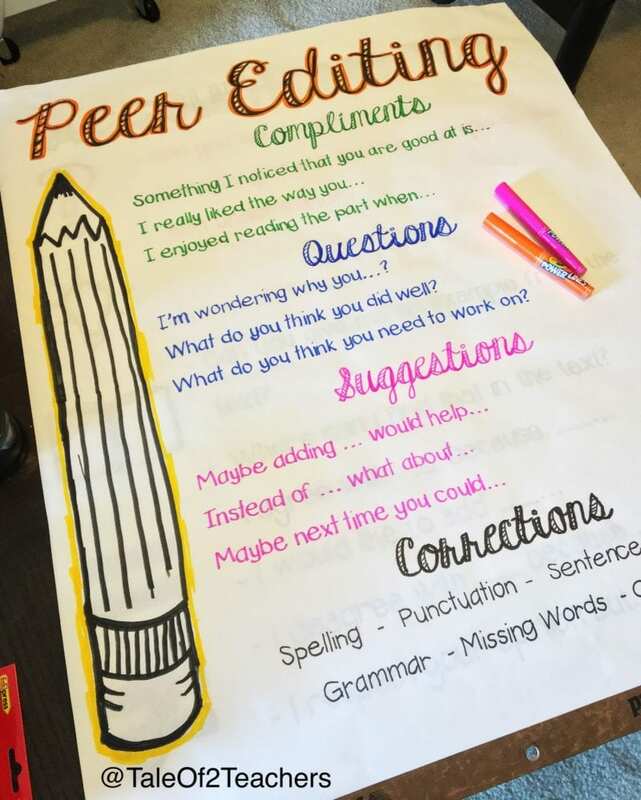 If you do peer-to-peer editing, then this is a great anchor chart for you. 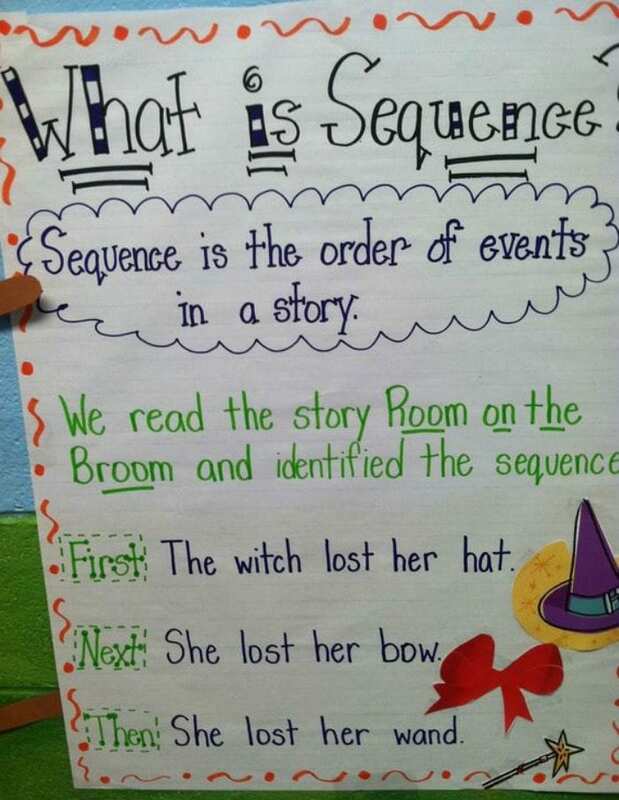 Get early elementary students to write longer, more descriptive sentences with this chart. Bonus: Use sentence strips to switch out the examples of strong sentences, based on student writing. 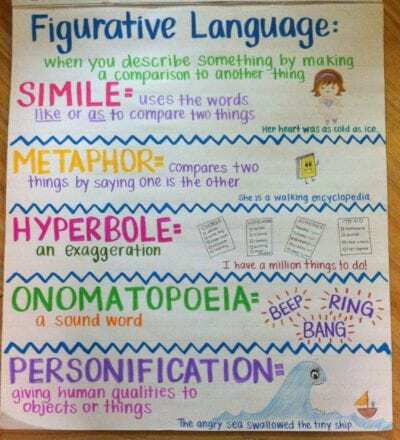 As you teach your students about figurative language and how to use it, you’ll want to have examples. 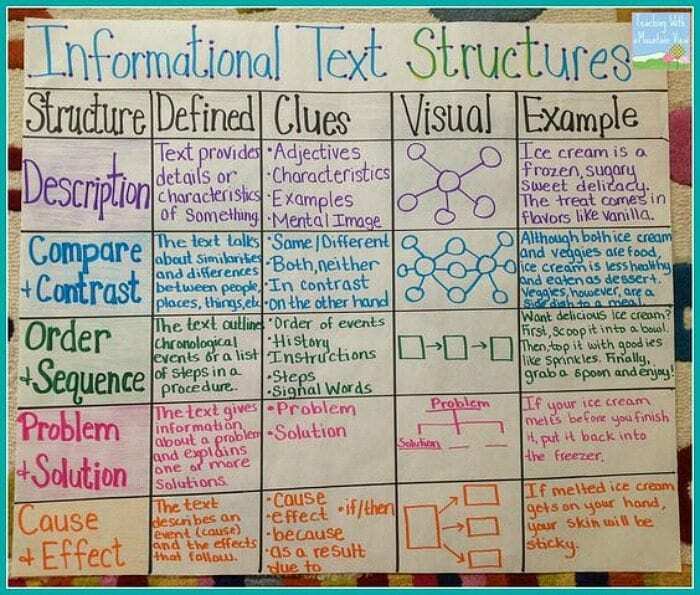 This anchor chart dives into five different concepts. Each of these could actually be their own anchor chart. 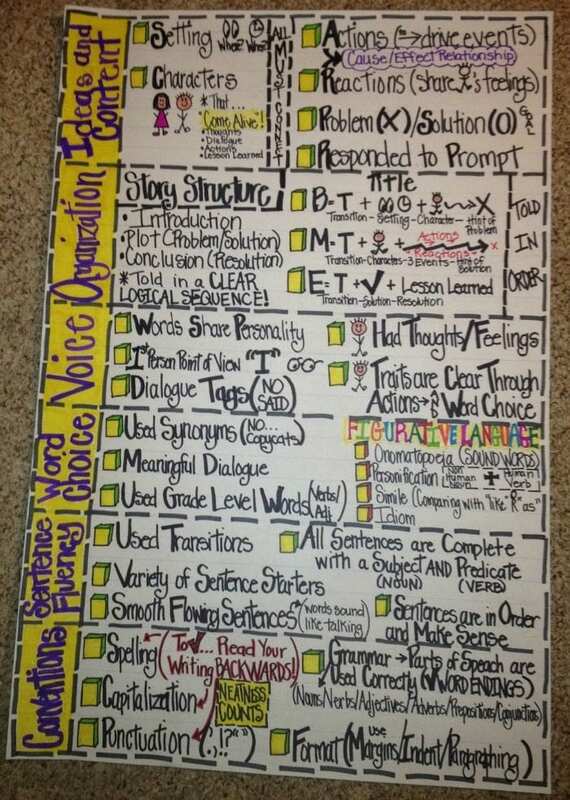 Perhaps have your students come up with examples on Post-its and then place them on the chart. 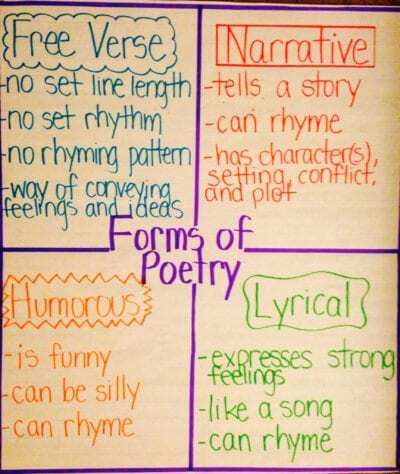 If you’re on a poetry unit, try an anchor chart like this. It’ll help your students start to understand the different types before they dive in to write it themselves. While it’s a really basic start, it’s a good option for younger kids. 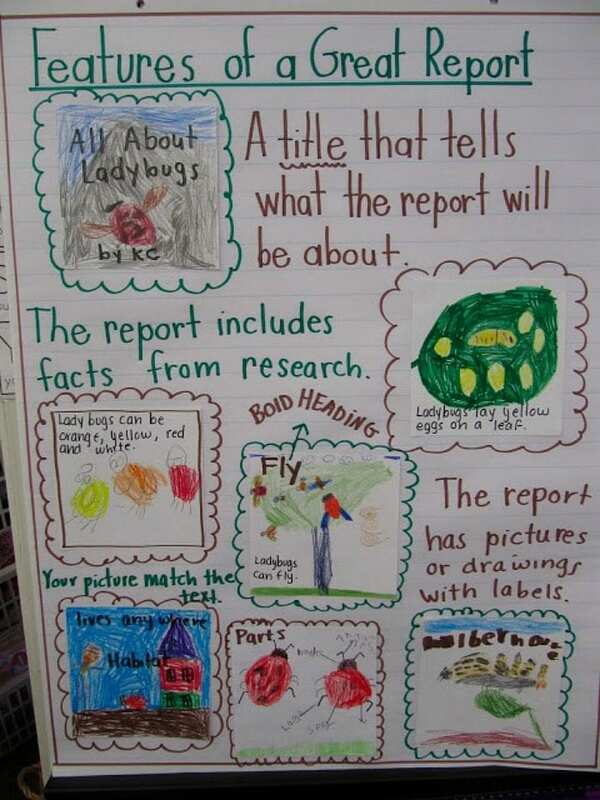 This second grade chart gives students the language to add their own thoughts into their writing. Modify this chart by highlighting key phrases for students with special needs. Or have students create different thought-bubble icons to represent each internal dialogue sentence starter. Pick an acronym when revising and editing. These charts are great for third, fourth, and fifth graders. Older students can get more targeted with editing marks. 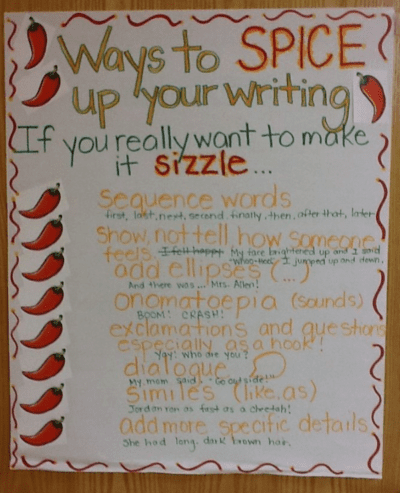 Have students choose one element, or “spice,” to add to their work as they revise. This chart works for students in elementary and middle school, depending on which elements they include. 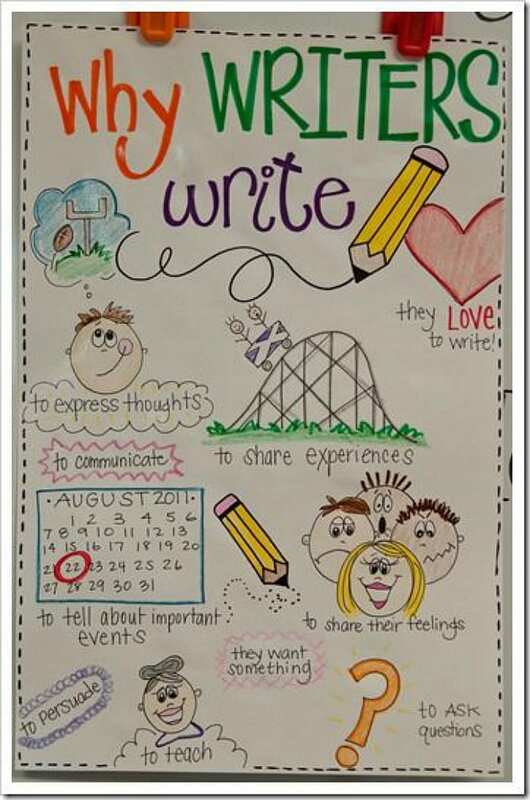 What are your favorite writing anchor charts? Share your ideas in our WeAreTeachers HELPLINE group on Facebook. 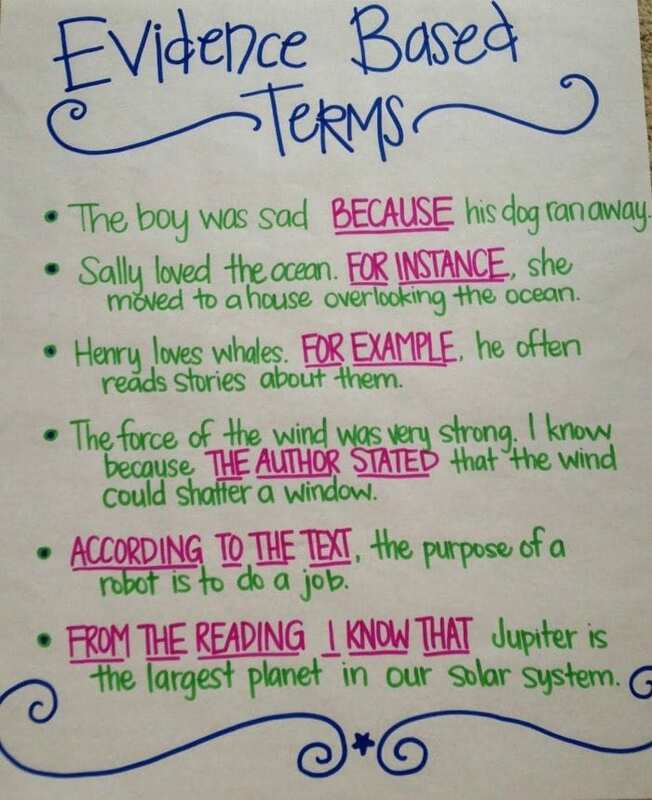 Plus, check out 25 anchor charts that teach reading comprehension.